Aug 29, 2012 Posted by AAfterwit on Aug 29, 2012 | Comments Off on Fairfax County Church Sues County Government Over Sign. Fairfax County Church Sues County Government Over Sign. As many people know, we are very interested in protecting the free speech of people here in the US. Even seemingly “innocent” restrictions are often an affront to the First Amendment. It is our belief even those small restrictions must be vigorously opposed lest the government start approving what we can an cannot say. Which brings us to a church in Fairfax County, Virginia. The Church of the Good Shepherd-United Methodist in Vienna, Virginia has decided to sue the Fairfax County Government over a the operation of a $37,000 sign the church installed. Consequently, a second code violation was also cited, saying that because the sign changes messages three times, it was not permitted in the county. 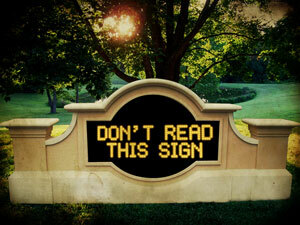 We have seen restrictions like this based on the idea of that signs that change messages are a “distraction” to drivers. There are no studies of which we are aware that prove that to be a fact, yet governments try to use that rational to restrict the speech on signs. In fact, because the Fairfax County ordinance allows for day, date, time, and weather to be displayed and changed repeatedly, one has to wonder if it is not the content of the wording on the sign rather than the number of times the messages change. Yet aesthetics in not part of the government’s job. If the electronic signs bother people, it is up to the people to let the businesses know they hate the signs. They choice is then up to the business to change the signs in the face of lost revenue or not. It is never up to the government to step on the First Amendment right of people, churches or businesses no matter how well intentioned law makers may be. The government has to show a compelling governmental interest when restricting speech. “We don’t like it” is not a compelling reason. It will be interesting to see how this lawsuit plays out. We hope the church wins because we are big on the rights of people and the First Amendment. Only time will tell. However, to all of the readers in Satellite Beach, Florida, we want to note that the city has a similar restriction on changing the message on a commercial sign. Here in Satellite Beach, you are allowed to change the message once every 24 hours. This means the case up in Fairfax may have an impact on those of us on the Space Coast.